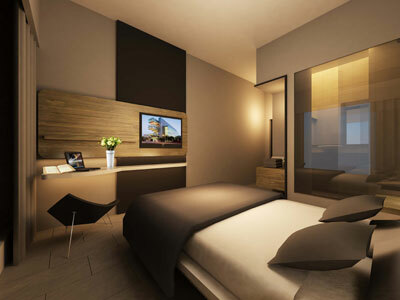 Jakarta, 11th April 2014 – Setting their sights on the emerging tourist destination of Kupang in East Nusa Tenggara, Archipelago International are set to launch their second hotel in the up-and-coming area, this time introducing the stylish NEO brand to the capital city. Designed for a young, budget-minded traveler, the new Hotel NEO Eltari – Kupang will be located at the heart of Kupang city. It will feature 137 stylish and comfortable guest rooms across three categories, as well as a “neoteric resto & bar”, a coffee shop, a swimming pool and a Spa and Fitness Center for guests' enjoyment. Business travelers can make use of the four meeting rooms, truly high-speed complimentary internet connection and ample parking spaces available from the lobby. The new Hotel NEO Eltari - Kupang will join Archipelago's already famous Aston brand in East Nusa Tenggara. The hotel is due to launch in early 2015 and will be shortly followed by the upcoming favehotel that is also set to open in Kupang. Hotel NEO Eltari - Kupang will be located close by to the historical airport, El Tari. During World War II, the city of Kupang (formerly known as Koepang) was the hub for refueling and landing for long-haul flights from Europe to Australia. Today, Kupang is the capital city of the province of East Nusa Tenggara, perched in the southwestern part of Timor Island. NEO hotels stand out as Indonesia’s first and only 100% non smoking select service hotels. They offer guest rooms with a full set of amenities and up-market facilities such as mini-bars, coffee makers, vanity mirrors, hairdryers and top of the line beddings with high knot count cotton linens and duvets. By offering such premium features, NEO hotels stay true to the group's credo: that well designed and exciting hotels do not need to be expensive. “The Island of Timor is still a fairly untouched tourist destination for many travelers. However, in recent years many adventurous tourists are straying from the typical spots to explore this beautiful corner of Indonesia. We are extremely excited to offer our affordable NEO accommodations to these travelers and we are excited to be a part of the rapid growth that this up-and-coming area will see over the coming years .” Said Norbert Vas, Vice President Sales & Marketing Archipelago International.